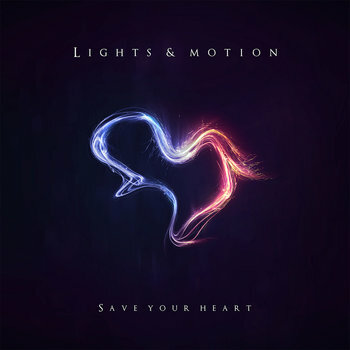 ‘Save Your Heart’, the second full studio album from Lights & Motion, is being launched today by Deep Elm Records. And launch is precisely the metaphor that Christoffer Franzen had in mind while laboring in the studio to create his latest sonic jewel. Franzen says about the album, “On Save Your Heart, I wanted to push the sound of Lights & Motion further out, reaching upwards towards the stratosphere, higher up in the ether of space while daring to be bolder in both statement and style.” He also had another sonic metaphor in mind for this record. “I wanted Save Your Heart to have more of a blueish or violet color in terms of sonic identity. In comparison, Reanimation had more of a yellowish tone”. Indeed, Lights & Motion’s debut album, ‘Reanimation’ was soaked in the yellowish hues of idealism and happiness. That record defied the somber conventions typical of post rock music and it’s glow is still radiating. So, while ‘Save Your Heart’ does pick up where ‘Reanimation’ left off and does not drastically alter the Lights & Motion formula, it does, in fact, burn cooler. The songs on ‘Save Your Heart’ are comparatively shorter, but thanks to a wider dynamic range and a discrete use of space in the recordings they sound more spacious and open. When the crescendos hit, they sound bigger than ever, but in between there are more nuances and sonic shades. We hear much more piano and voice on this record and every instrument is given its moments to shine individually, including a very cool new distorted bass sound that Franzen uses on a couple of tracks. Among the highlights are the opening tracks, ‘Heartbeats’ and ‘Ultraviolet’ which blend seamless together and will immediately make fans of ‘Reanimation’ at home, coming off almost like extensions of that album with their trademark build up and soaring crescendos. Also, a treat for longtime followers of Lights & Motion is the track which follows, a resplendent new recording of ‘Sparks’. ‘Snow’ brings out a delicious new distorted bass sound and then builds up layer by layer to recreate a sense of child-like wonder that the title suggests. It ends up being a perfect segue into ‘Bright Eyes’ where we are again reminded that Franzen is not just a fine composer & musician, but also a very good vocalist. On the latter half of the album ‘Crystalline’ is a real stand out, beginning with just a piano and strings and then exploding to a rousing conclusion. ‘Orbit’ then provides an atmospheric prologue which leads into a final trio of songs that are huge in scope and sound, ‘We Are Ghosts’, ‘Atlas’, and the title track. While ‘Reanimation’ was a leap of faith by Franzen, ‘Save Your Heart’ is an assured follow up from an artist whose vision is being refined and whose confidence and abilities are growing. It should most definitely please fans of Lights & Motion and will undoubtedly win over many more new ones.